Ear correction surgery, called Pinnaplasty or Octoplasty, is normally performed to pin back sticking out ears and is a fairly common surgical procedure in children and adults. It can also be used to alter the shape and size of a person's ears. Ear prominence, sticking out or ‘bat ears’, is usually caused by one or two issues. It can be that the natural cartilage fold which curves the ear backwards is missing, or not fully developed, or it can be as that an oversized 'bowl' of cartilage next to the ear canal has formed. Occassionally it can be a combination of both. In babies and young children, the condition can often be corrected by gentle taping of the ears to the side of the head or wearing ear splints called 'ear buddies'. If this does not resolve the problem, or it remains uncorrected after infancy, a Pinnaplasty will be needed (although the procedure won't be performed until the child is around 6 years old as the ear cartilage is still too soft). Some ear deformities are temporary and they may resolve themselves as the child grows and the ear takes on a more normal form. However if you are concerned about your child's ears, please contact Mr Chana. He has performed many Pinnaplasty operations during his career and is highly experienced in advising how best to correct a particular condition. Aside from addressing the issues with prominent ears, Mr Chana is also skilled in correcting misshapen or deformed ears, both in children and adults. If however, you are looking to achieve perfect symmetry, it is important to understand that a degree of asymmetry is usual with most people's ears. Mr Chana will always aim for absolute symmetry, but this this cannot be guaranteed, particularly if you have excessively large ears. Pinnaplasty for an adult or a child can be performed under local anaesthetic. It normally takes a couple of hours and patients are admitted on a day case basis. A general anaesthetic is normally only used on young children. During the operation to pin back the ears, incisions are placed behind the ear. 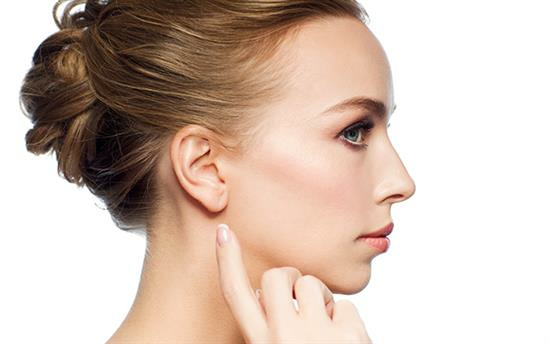 The cartilage of the ear is remodelled and sutures are used to permanently reposition the ear. The aim of the surgery is to create a natural shape to the new ear which is set back closer to the scalp. Very occasionally part of the cartilage may need to be reduced in size to obtain an adequate position of the ear. A head dressing is used to allow the ears to heal in their new position. Discomfort from Pinnaplasty surgery is mild and easily controlled with painkillers which will be prescribed. Aspirin or aspirin like medication (non-­steroidal anti-­inflammatory tablets) must not be taken. You will need to sleep in an elevated position for the first few nights and it is important not to bend over or carry out vigorous activities for a few days, otherwise post-­operative bleeding could result. The head dressing must remain in place for a week after which the stitches are removed. There may still be some bruising and swelling following removal of the dressings and stitches but this will settle rapidly. Within a week or two the improvement in the ears will be apparent. After removal of the dressings, it is advisable to wear a sports headband at night for a period of up to six weeks. As with all surgical operations, infection and bleeding are potential risks, but in most cases they are rare. If a patient should develop an infection, it can easily be treated with antibiotics. Occasionally, a blood vessel can leak post­-operatively which will cause bleeding and stained dressings. Pain may also follow. If things don't settle down, a return to the operating theatre may be needed, but this is a fairly rare occurance. Numbness is common after Pinnaplasty surgery, but the feeling in the ears will eventually return. Mr Chana will provide you with a comprehensive information leaflet on Pinnaplasty following your initial consultation. Is Pinnaplasty right for me? If you are concerned about ear prominence it can easily be corrected in the majority of individuals. It will provide an immediate improvement in your appearance and can significantly boost self-confidence. What age can a Pinnaplasty be carried out? Pinnaplasty can be carried out in children or adults. In children the best age is after the age of 5 or 6 when the ear cartilage is better developed and when the child can better cope with the postsurgical care. In adults a Pinnaplasty can be performed at any age. Pinnaplasty surgey usually causes only mild discomfort which can be easily controlled with mild painkillers. Are there any non-surgical options to Pinnaplasty? Recently, a new revolutionary treatment has recently come onto the market. It's a metal clip called an Earfold. It is permanently inserted onto the ear cartilage and folds back the ear so it sits close to the sides of the head. However, it cannot reshape the ear naturally in three dimensions and the degree of setback it provides is somewhat limited. Note: At the present time this treatment unfortunately seems to only be suitable for a very limited number of patients. I had my consultation with Mr Chana in December and didn't even need to go away to think about booking the procedure in. Mr Chana and all of his team are extremely professional, caring and very helpful. The entire experience was stress free, with no complications before, during or after surgery. I was and still am (5 months on) so impressed with the results - the procedure for me has been life changing and I can't thank Mr Chana enough.